A Stock Market Buying Opportunity? It’s no secret that the market has been declining rapidly over the past 6 weeks or so. This has resulted in oversold conditions similar to those seen last August when the subrime fears began to manifest themselves in stock prices. Back then, after the bottom was reached, the S&P 500 rose about 7% in under 2 months, which is a huge surge by any standard given that the S&P 500 represents 75% of all US stocks by market value. So could we be seeing this happening again? 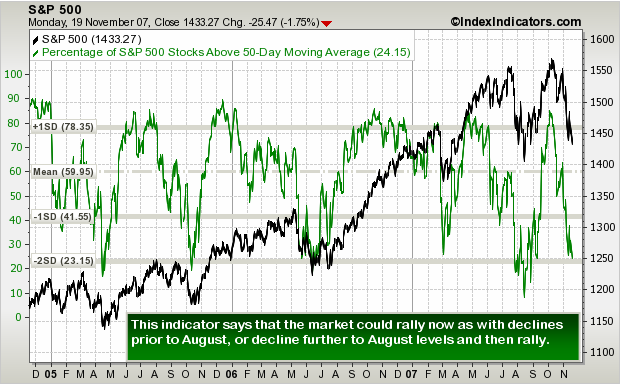 Well, the charts say that stocks are deeply oversold, but not to the same extent as last August yet. You can see in the chart below of the S&P 500 versus the Percentage of S&P 500 Stocks Above their 50-Day Moving Average that there are two possible scenarios; we could bounce here, as with declines before August, OR we could roughly decline to August levels and then rally strongly. Whichever scenario you pick, there is a high probability that the stock market could rally within the coming 4 weeks. However, we must remember that last time the rally was partially fuelled by a Fed rate cut.